The move to value based care is no longer a question of if or when, it’s now. As health systems prepare for impending change in their revenue, they must decide if they are going to lead, follow or resist the transformation at their own peril. Leading Health Systems are already partnering with value-based payers and creating shared and full-risk contracts. New leadership teams, focused on Population Health Management (PHM) are essential to success under new alternative payment models that reward maintaining a healthy population. As a competitive business necessity, health systems must continue the acquisition of value-based care payer contracts. Those contracts also include the acquisition of significant financial risk. PHM’s task is to identify, track and manage the real drivers of costs across their populations and in doing so, manage the risk. the top 50 percent of the population ranked by their expenditures accounted for 97.1 percent of overall healthcare expenditures with an annual mean expenditure of $8,619. PHM helps to describe the value-based care evolution underway. PHM has become a key concept for health systems who are trying to recalibrate their traditional operations to meet the growing challenges of value-based care payment models and accountable care. The ability to sort a defined population into clearly labeled buckets — well; low-risk; rising-risk; high-risk — is a foundational step for developing the standardized, comprehensive care and health behavior change framework necessary to address the high costs of chronic diseases, reduce preventable readmissions, and connect chronic disease population groups to community-based resources they need to live healthier lives. With high risk/acute patients costing two to five times more than other buckets of populations, the ability to offer cost effective Care Management solutions is key. However, even with the best Care Management practices, the constant influx of rising-risk population groups migrating into the high-risk will offset efforts to maintain or lower costs. The rising-risk chronic disease population group typically represent 20 to 30 percent of a defined population, and due to their numbers, can actually account for a higher total healthcare spend than the high risk. In addition, about 18 percent of rising-risk population group can become high-risk each year. Unlike the high risk populations, PHM can target the risk factors and behaviors that underlie multiple chronic diseases, rather than just the diagnose the disease states themselves. 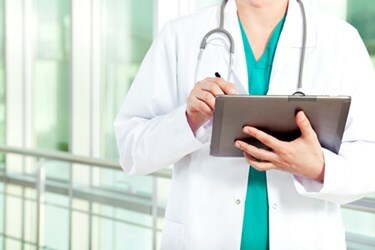 This enables health care managers to target the root causes of multiple conditions to slow, stop or even reverse the progression of chronic diseases. Chronic diseases appear gradually. If unchecked, the illness eventually becomes a life threat. This is a fundamental different model of illness than that of acute illness, and healthcare has not totally grasped that difference. A chronic disease is not like a raging house fire. It’s like a smoldering fire in a pile of leaves that slowly reaches the point of flame. Healthcare has designated a staggering amount of resources around the life ending fire, and ignored 90 percent of the smoldering chronic disease progression that is steadily increasing population risk of health and cost. Today, almost 88 percent of U.S. healthcare dollars are spent on medical care — access to physicians, hospitals, procedures, drugs, etc. However, medical care only accounts for approximately 10 percent of a person’s health. The other determinants of a person’s health — their lifestyle and behavior choices, genetics, human biology, social determinants, and environmental determinants — account for approximately 90 percent of their health outcomes. 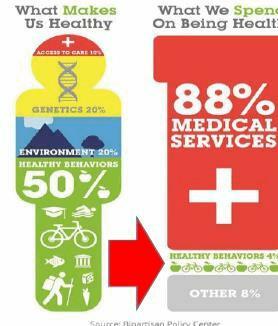 Healthcare resources and dollars must now be dedicated to improving lifestyle and behavior. The overall goal of PHM centers on finding solutions that can combat the rising tide of populations with multiple chronic diseases. Health systems must be able to stop the rising-risk flow along the care continuum towards and into the high-risk groups. 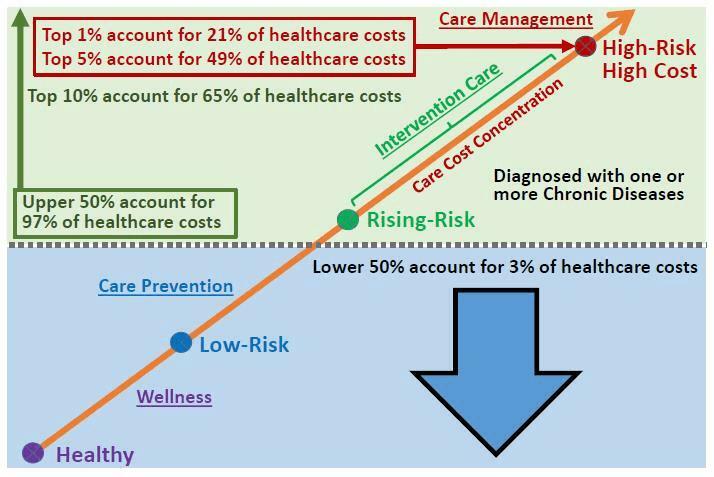 Care costs escalate exponentially while moving along the continuum after chronic disease diagnosis. Given the dramatic rise in financial risk, a new standard of care needs to be created, that will act as a firewall between the rising-risk and high-risk. 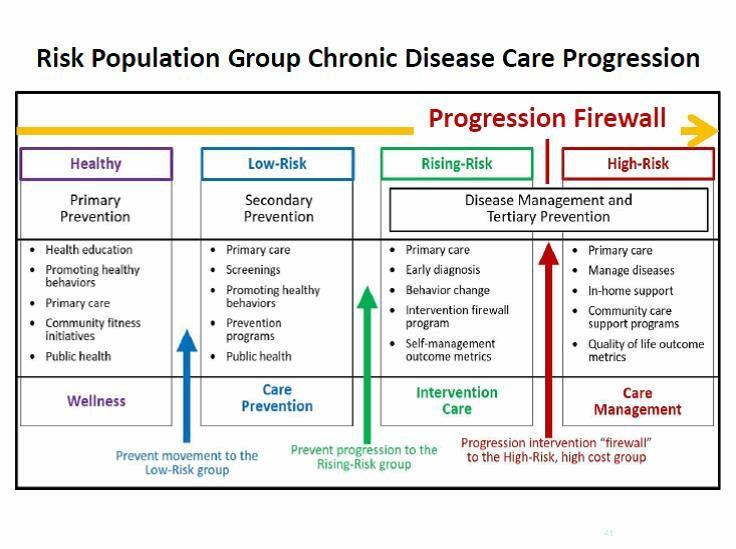 This firewall or intervention needs to address population groups with one or more chronic conditions, and work to slow, stop and even reverse the progression of those diseases. As a matter of health system survival, value-based care contract acquisitions cannot wait. Most chronic diseases are not curable, but can be managed. Changing health behaviors can slow, stop or even reverse the progression of a chronic disease, particularly from the point where symptoms emerge until a life threat exists. Rather than curing chronic illness, health systems are learning to manage its progression. Systems need to reach across the aisle to community resources to fill this gap in care. As patients are diagnosed and populations stratified, clinical care teams will transition chronic disease groups to community care teams for intervention program participation in more accessible, lower cost settings. This is the firewall program and new standard of care that health systems must have to reduce the migration of the rising-risk into the high cost category. Phil Trotter, B.S., leads the Exercise is Medicine® (EIM) on-the-ground team to integrate physical activity as a standard component of intervention, prevention and care management programs that support the implementation of Community Care Collaboratives and the necessary resources for community-based delivery of healthcare to payer, patient and underserved populations. Phil is a Community Care thought leader and Collaborative subject matter expert consulting with health system leadership and population health management executives and their teams. Felipe Lobelo, MD Ph.D., is an associate professor of Global Health at Emory’s Rollins School of Public Health and directs the EIM Global Research and Collaboration Center (EIM-GRCC). The EIM-GRCC is the academic hub in charge of leading the evaluation of the EIM initiative, in collaboration with partnering health care systems, community organizations, and fitness and technology companies. Ashley John Heather, B.A., co-founder of Off The Scale® a turnkey, chronic disease intervention platform.